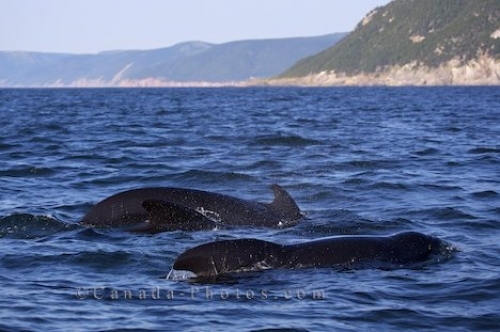 We booked a whale watching trip from Pleasant Bay in Cape Breton, Nova Scotia, where we headed out into the Gulf of St Lawrence and encountered Long-Finned Pilot Whales. Although called whales, they are actually members of the dolphin family. The shiny black coloring of the Long-Finned Pilot Whales glistens in the sunlight as they play around in the Gulf of St Lawrence. Picture of a group of Long-Finned Pilot Whales that tourists spotted aboard a whale watching trip in Cape Breton, Nova Scotia.